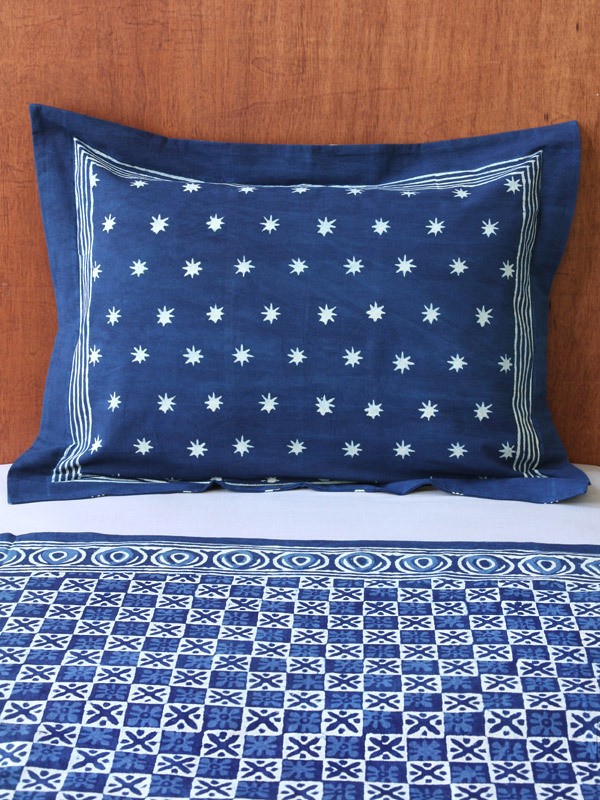 If you’ve long loved to stare up at the night time sky and wonder what’s out there, or if you love nights “down here” under sweet starlight, you’ll love introducing our star studded, hand printed indigo print to your home. Enjoy the stars day and night! 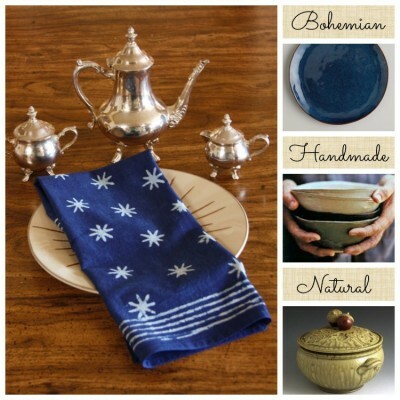 Find prints for the dining room, bedroom, bath, kitchen and living room. 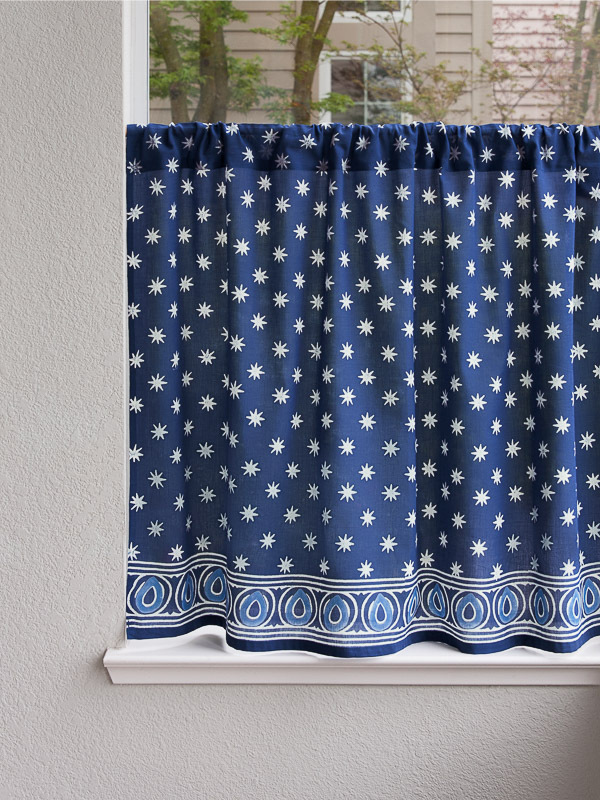 Our bright, resist-dye printed Starry Nights really stuns in the dining room. 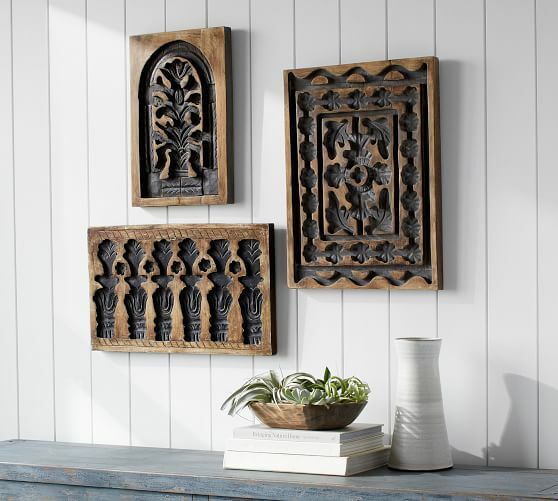 You’ll find this print equal parts rustic, artistic, and exotic. 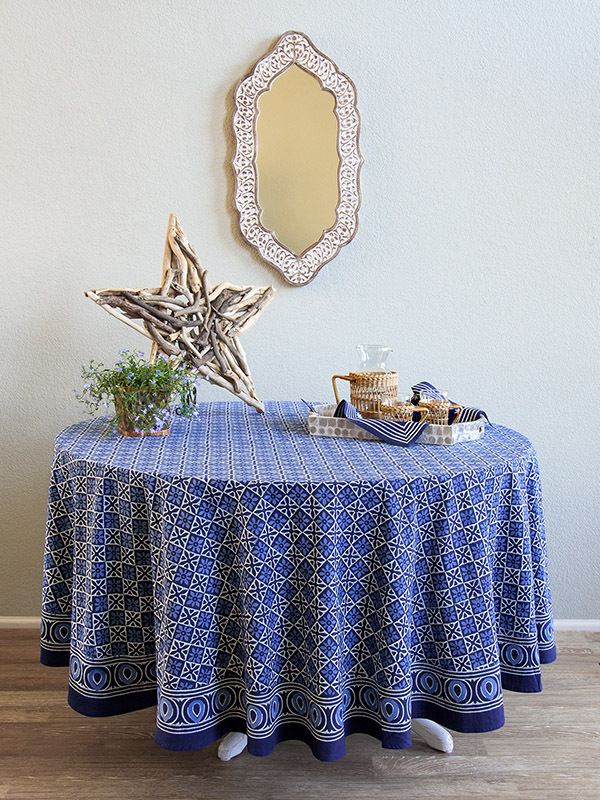 Use it to transform the space you gather with family and entertain friends into a warmer, brighter, more celestial space. 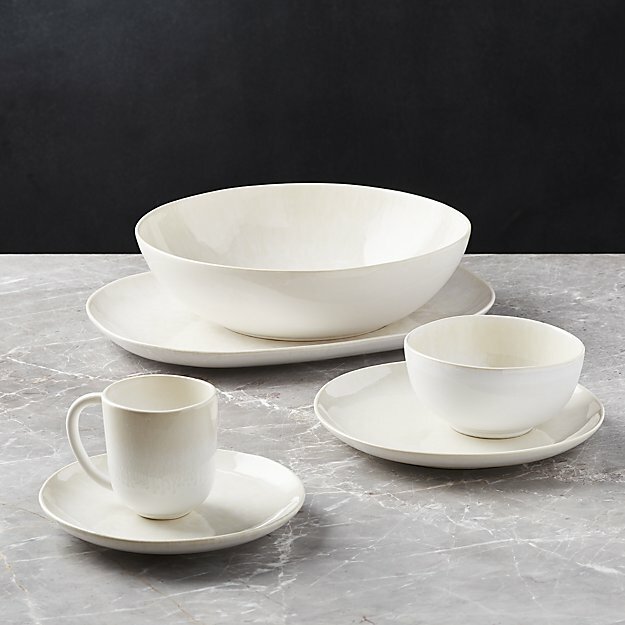 Of course, we want to let our Starry Nights table linens shine, so we are gravitating toward using this fluid rim, creamy ceramic dinnerware. 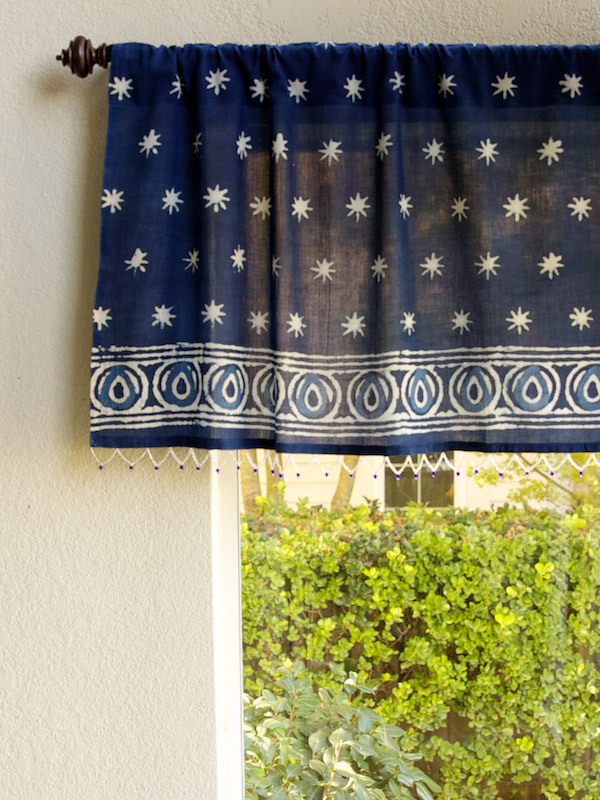 This is elegant stuff, but allows Starry Nights to keep center stage. 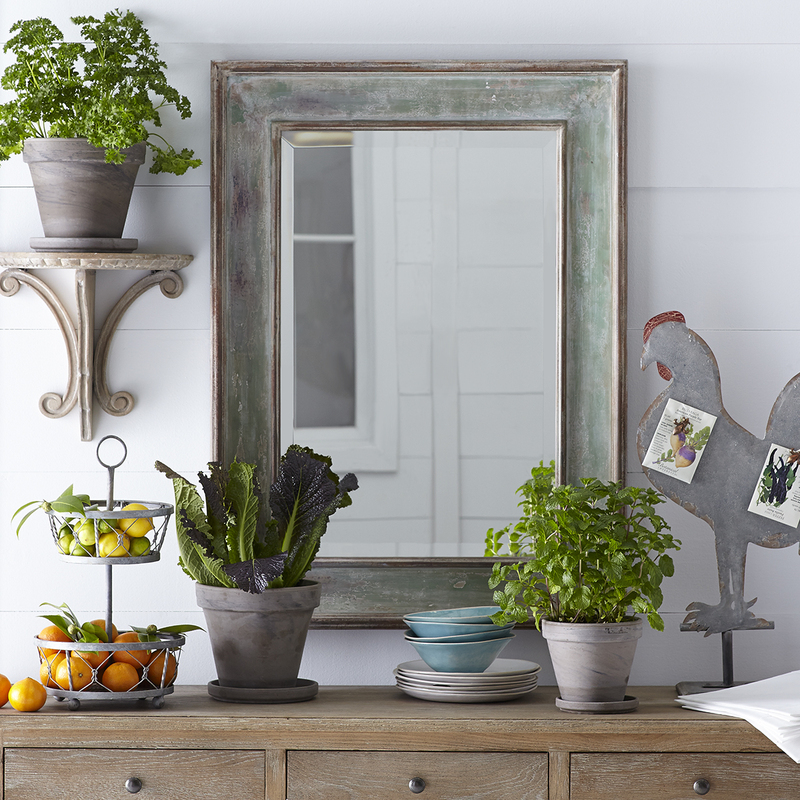 We love mirrors in the dining room. 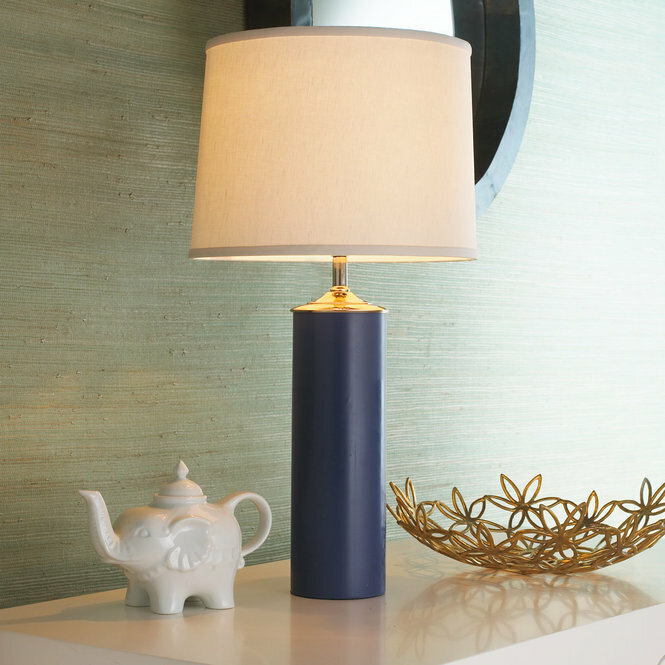 They cast light, and add brightness or candlelit ambiance. Of course, this mirror will reflect twinkling stars, right? 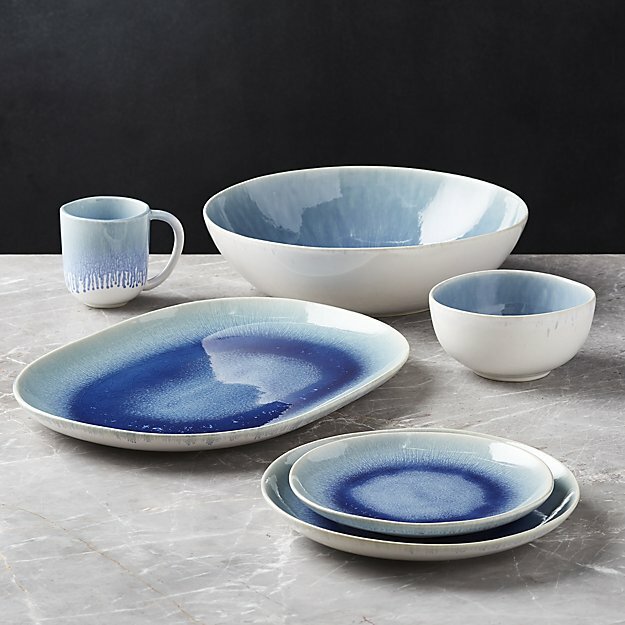 If you prefer a bit of color in your dinnerware, we suggest a cousin of our creamy crockery in a pooling, crackling blue glaze. Just lovely! Sleep Under the Stars Every Night! 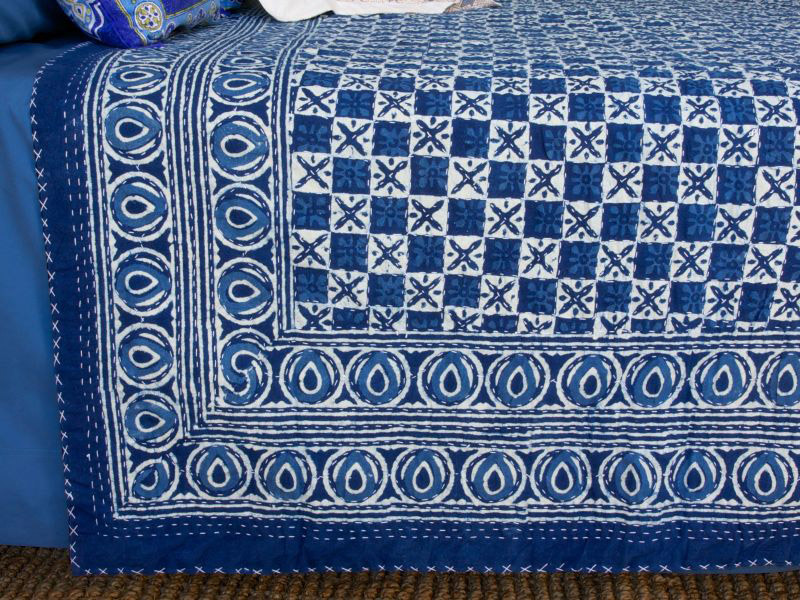 Starry Nights will define a bedroom, and create the feel of an organic, easy space that blends the lines between indoor and outdoor living. 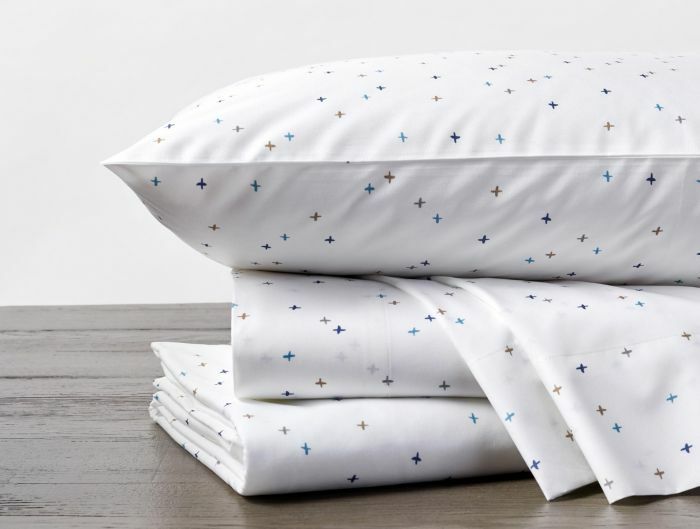 Choose coordinating Starry Nights pillow shams to top your bed, and set the stage for sweet dreams. 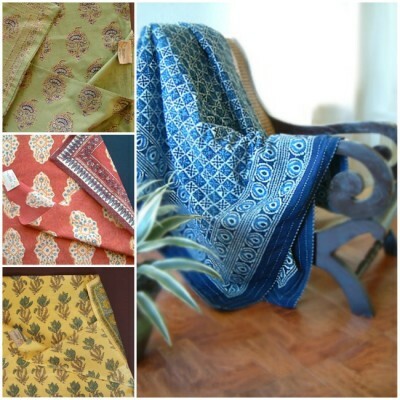 (Note: our designs are printed on super soft, high quality cotton. 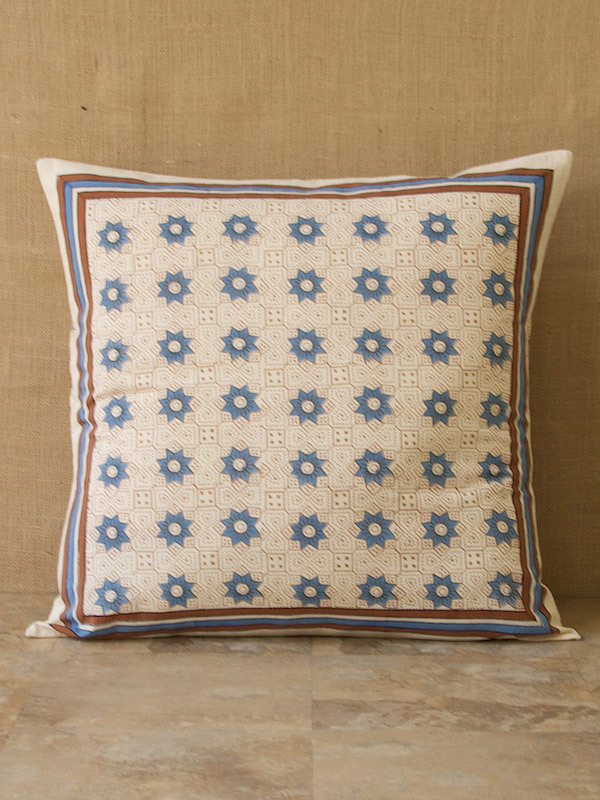 This is a dreamy pillowcase upon which to rest your head! 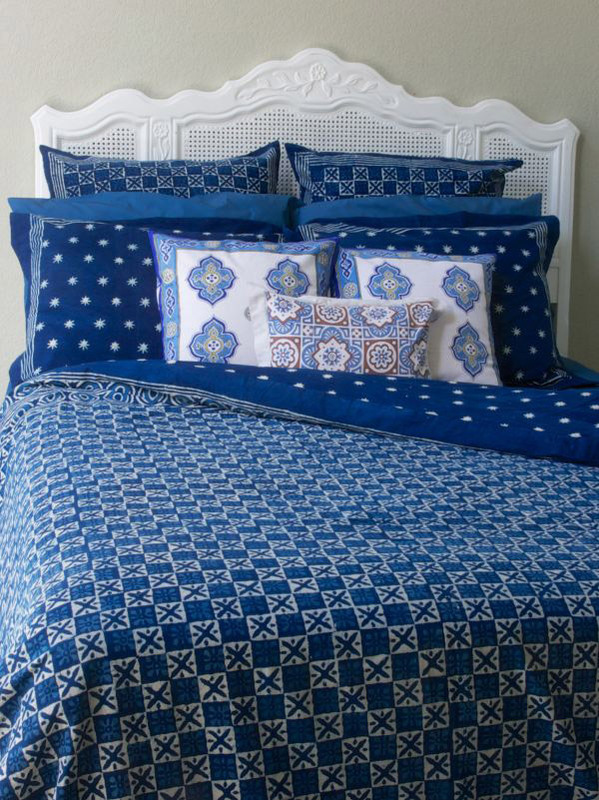 Why not add a few more stars to our night sky bedroom? 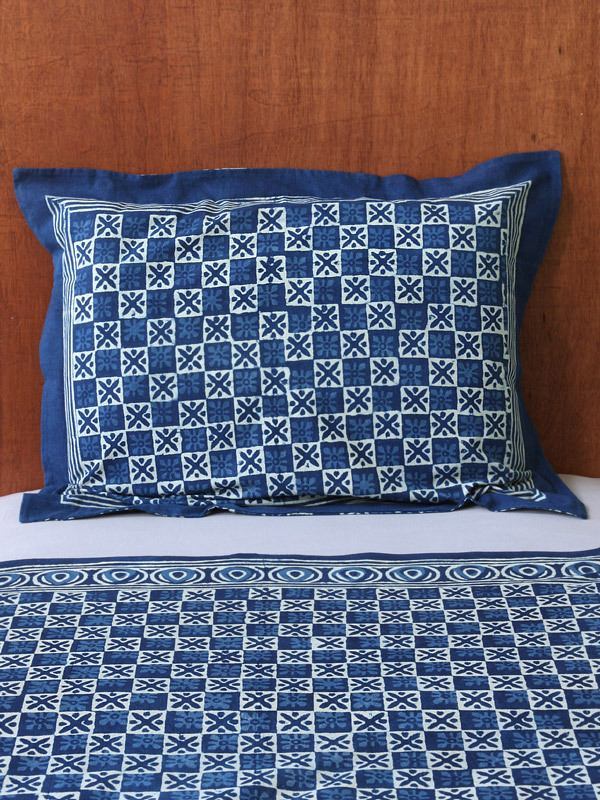 Tuck yourself into luscious Coyuchi sheets, printed in an array of twinkles. 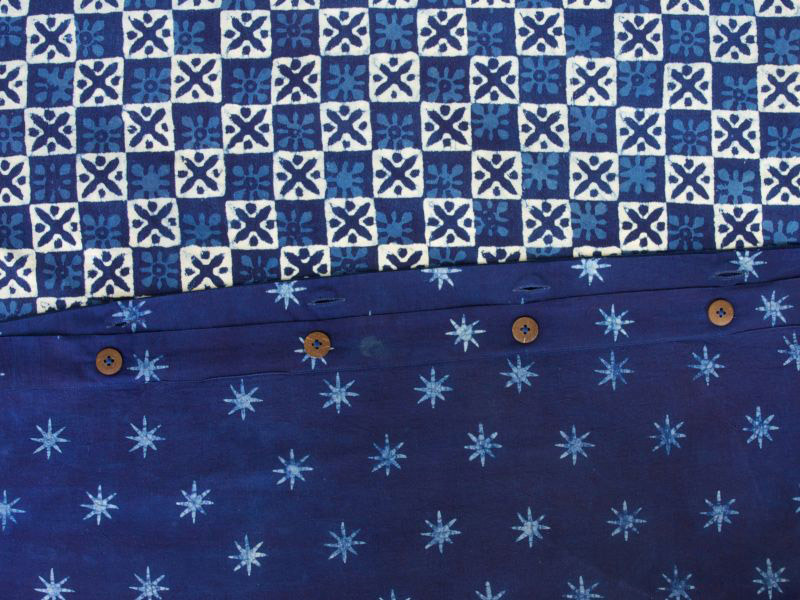 If you’re truly in love with our indigo (which we totally understand), you’ll want to choose the reverse pattern of Starry Nights and top your bed with these rich, resplendent shams! 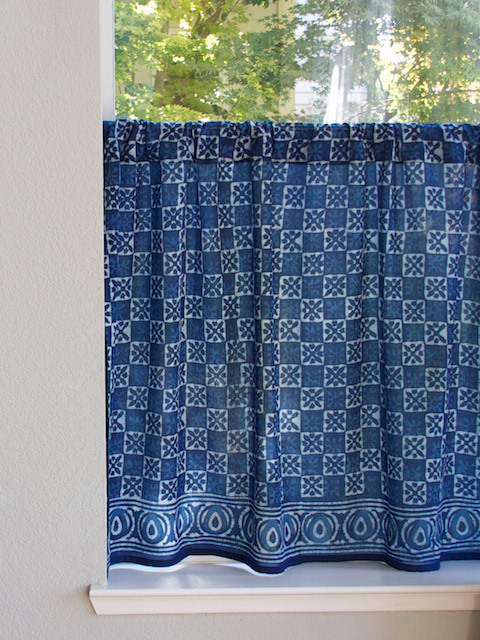 Unfurl a cosmic field around your living room with pillows, curtains, mirrors, and lighting. 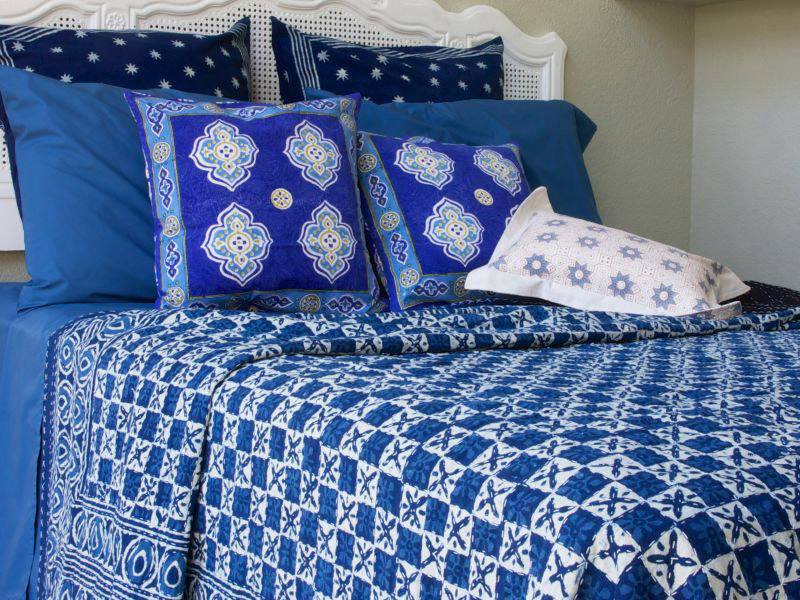 Our deep blue palette keeps the room fresh and inviting, and is nicely accented by a just a few more “blingy” pieces. 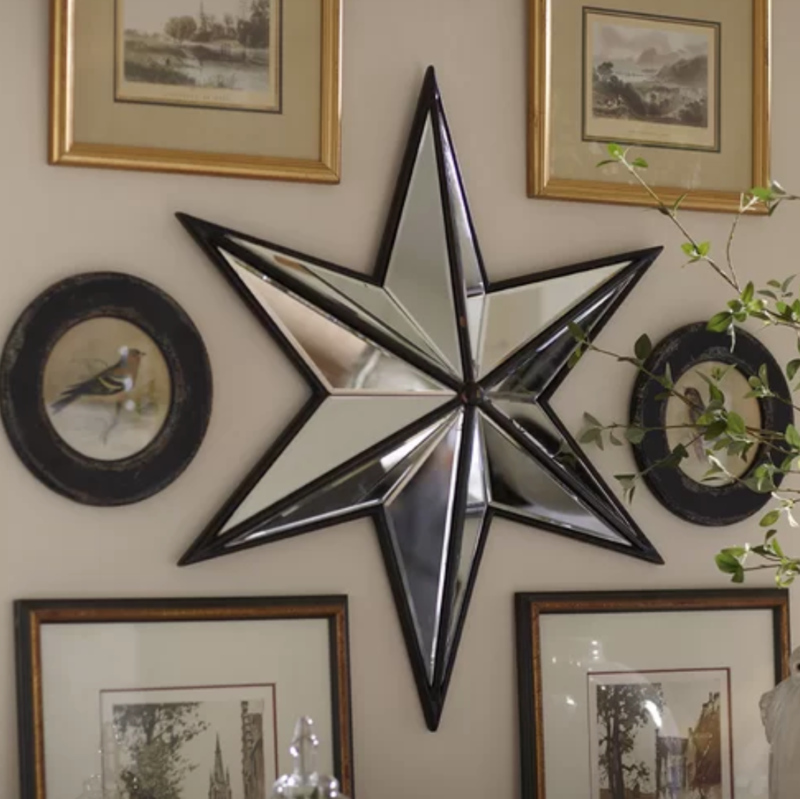 The Nova mirror is a generously sized mirrored star which, as shown, works beautifully in an assemblage of photos and artwork on the wall. It has the heft to stand alone as well, and if you’d like to call more attention to this piece, let it go solo in a prime spot. 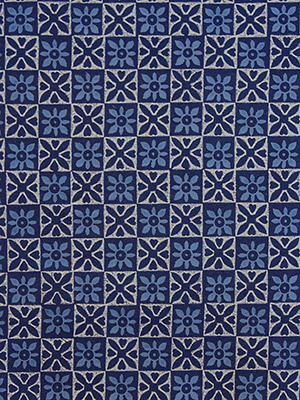 Our Moroccan tile – inspired print, Ocean Breezes, is a lovely complement to Starry Nights. 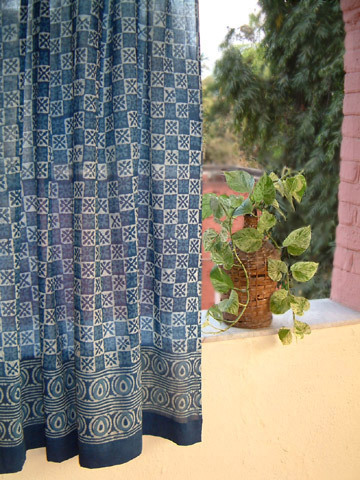 Both share graphic lines and blue tones, but Ocean Breezes introduces a more detailed design as well as a softer range of colors. Of course we can’t expect Starry Nights to bring all the shine to our space. We’ll have to have a bit of lighting as well. 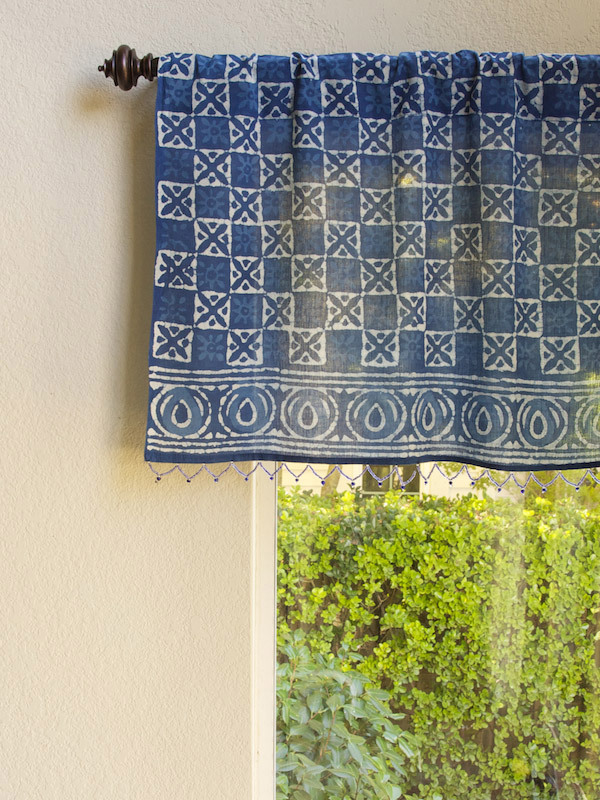 We think this deep blue column, topped with bright brass pairs perfectly with our indigo print. 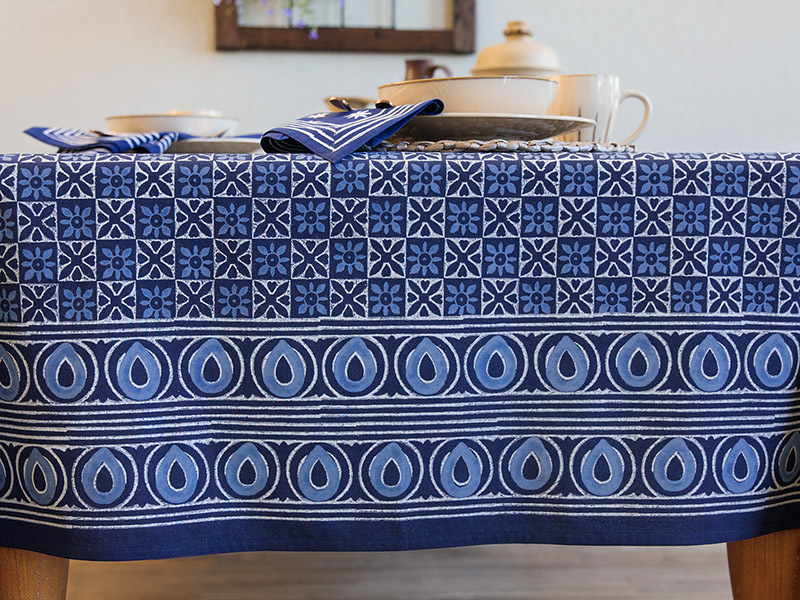 Indigo Blue Makes Your Kitchen Look Like it’s Showing Off! 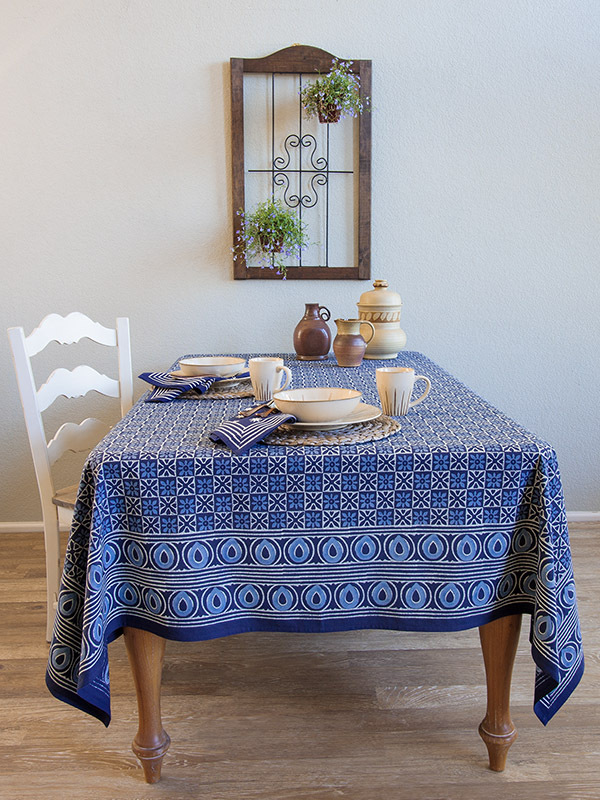 Bright blue in the kitchen makes every morning feel upbeat, and every day seem a bit more inviting. 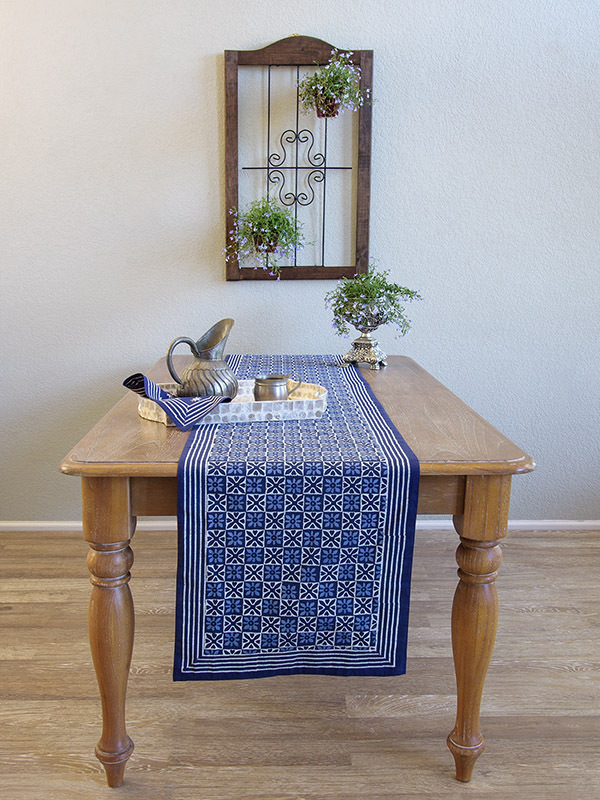 Use our artisan made table runner, napkins and curtains to bring cheer and style to your space! 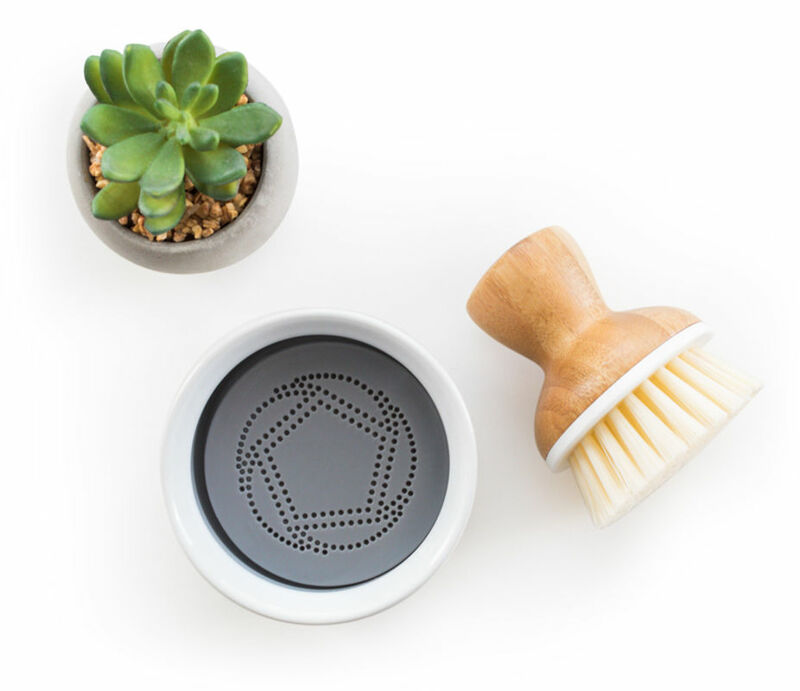 This little walnut-handled scrub brush has truly become a favorite purchase this year. 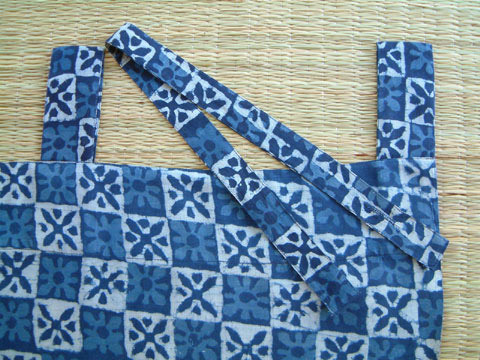 Why says that style and hard working function can’t go hand in hand? 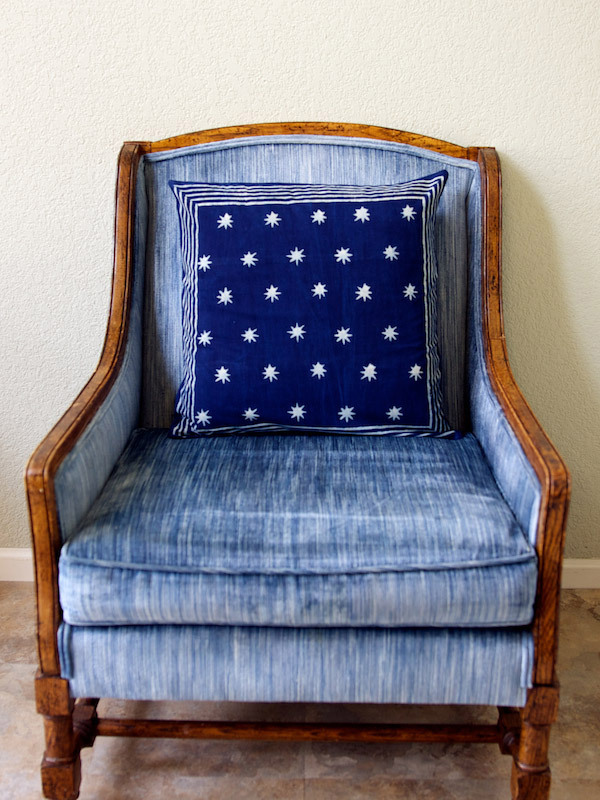 We like natural woods along with Starry Nights, and this little beauty fits right in. Every kitchen should have a sturdy pitcher. 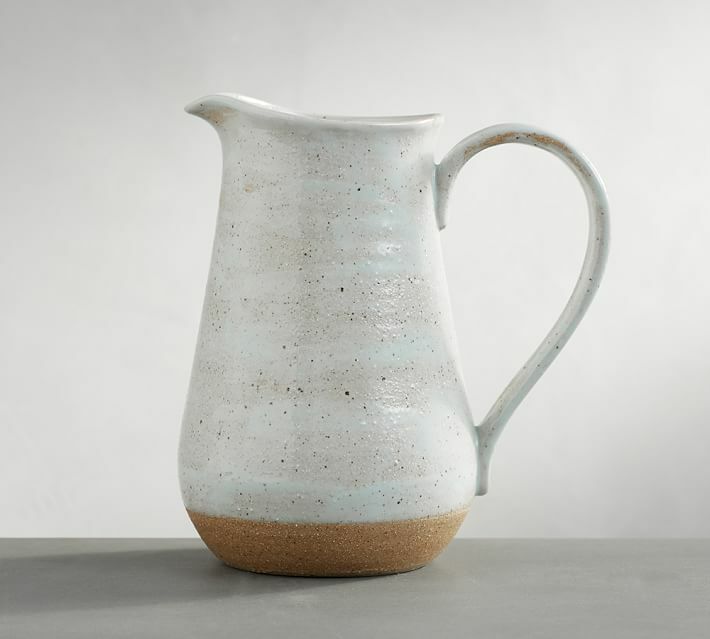 Natural clay and creamy, speckled glaze make this a lovely companion for our nature inspired linens. Kitchens do not, and should not be devoid of art. 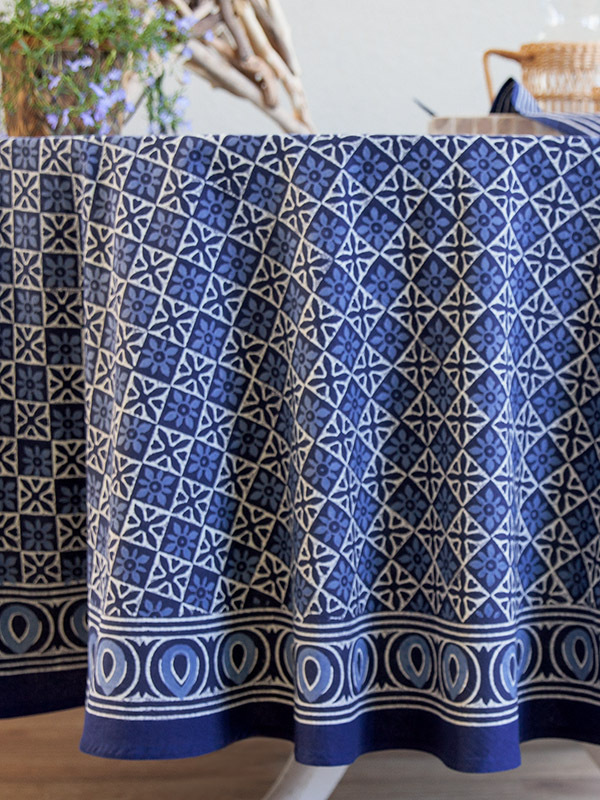 We like these hand carved blocks along with Starry Nights table linens for their point of connection, and connected style. Finally, the Starry Nights bath is inviting and restful. 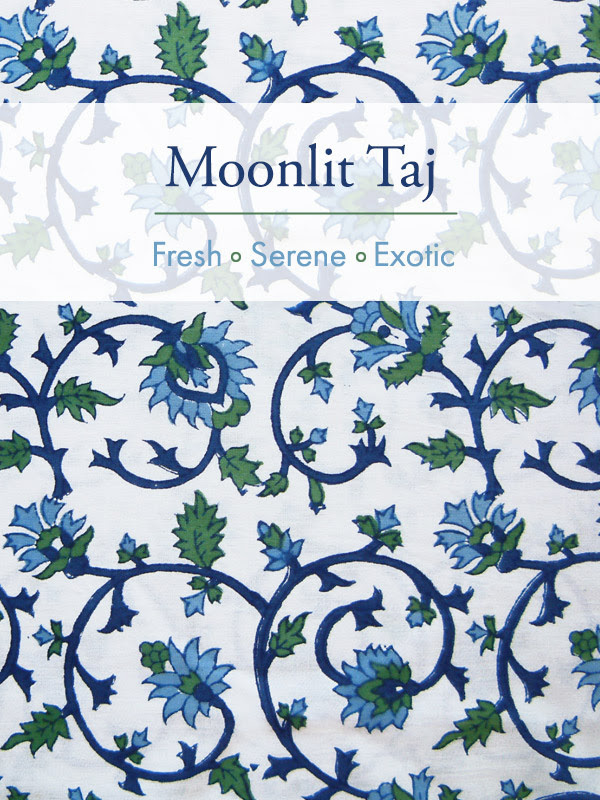 Blues tend to invoke notes of serenity and freshness, which are just the vibe we’d like to have in our baths. 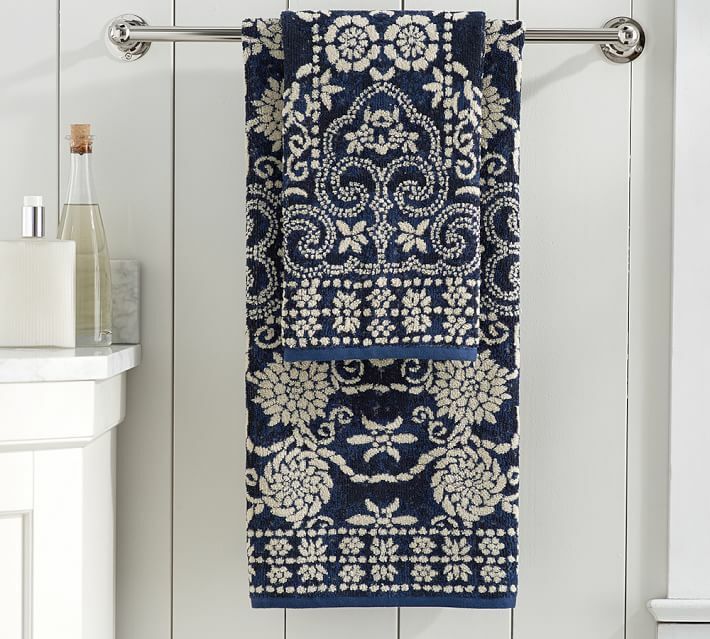 Choose dark blue bath towels if you have white or light walls, and white towels if your walls are colored. 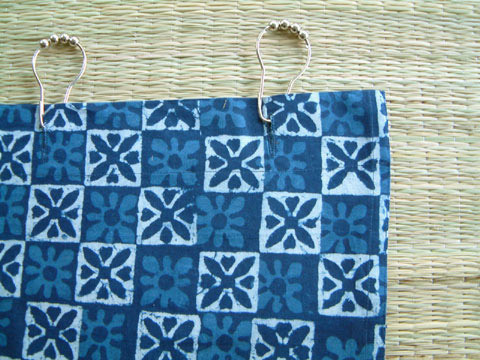 The pattern and color woven into these towels are gorgeous! 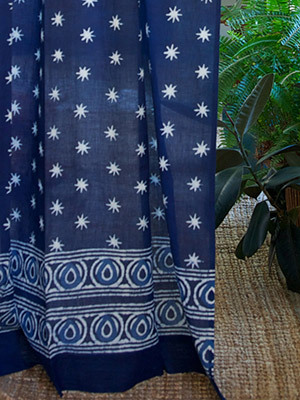 While not “starry” in any way, the intricacies and exotic style will play well with our artisan made print. 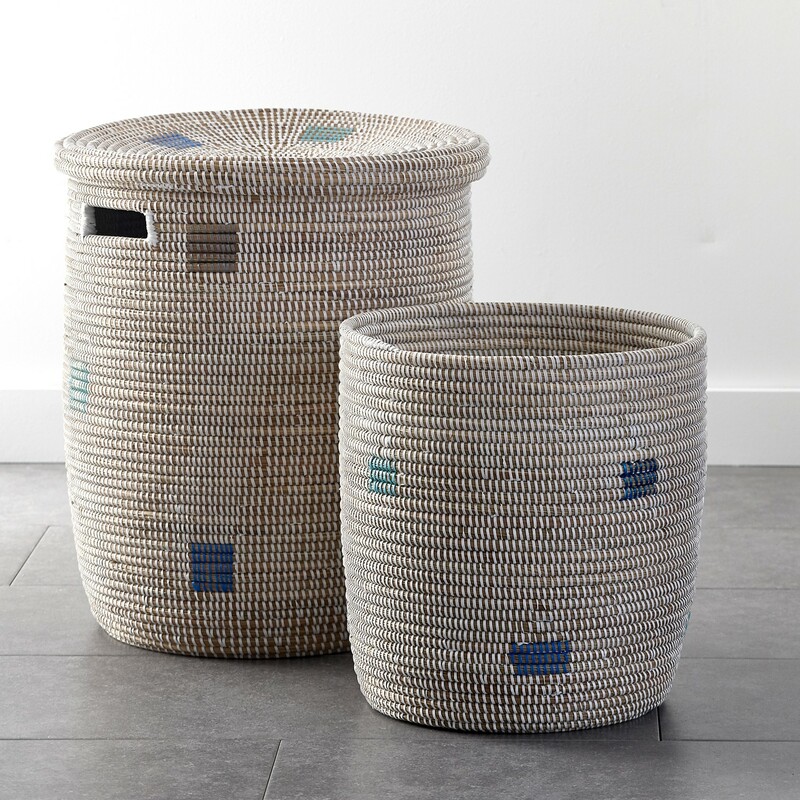 Love the graphic blocks of color on these whitewashed hampers. 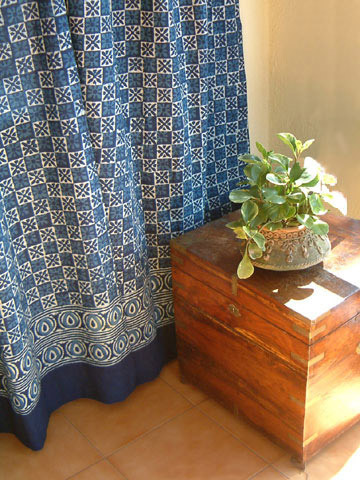 They convey a lovely sea-side feel, and the organic nature of the baskets make them a win alongside our indigo shower curtain. 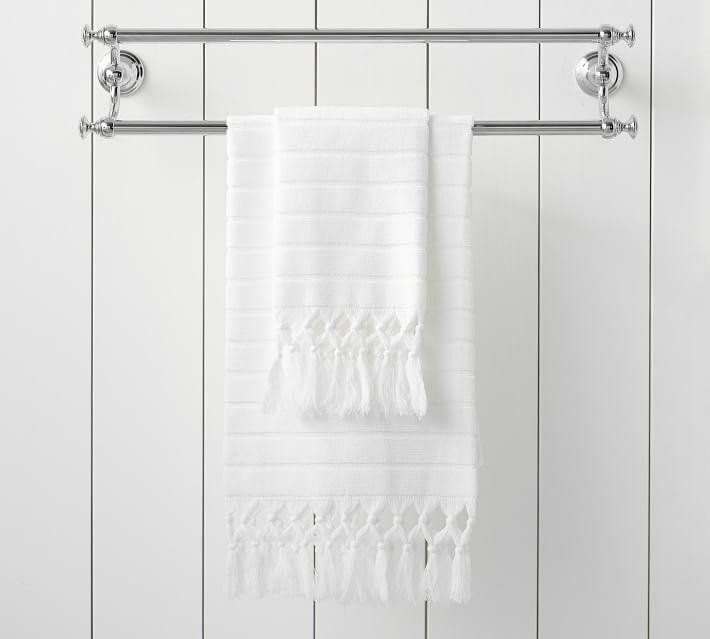 A pristine, white towel, finished with knotted tassels adds an unexpected note of subtle style to your bath. 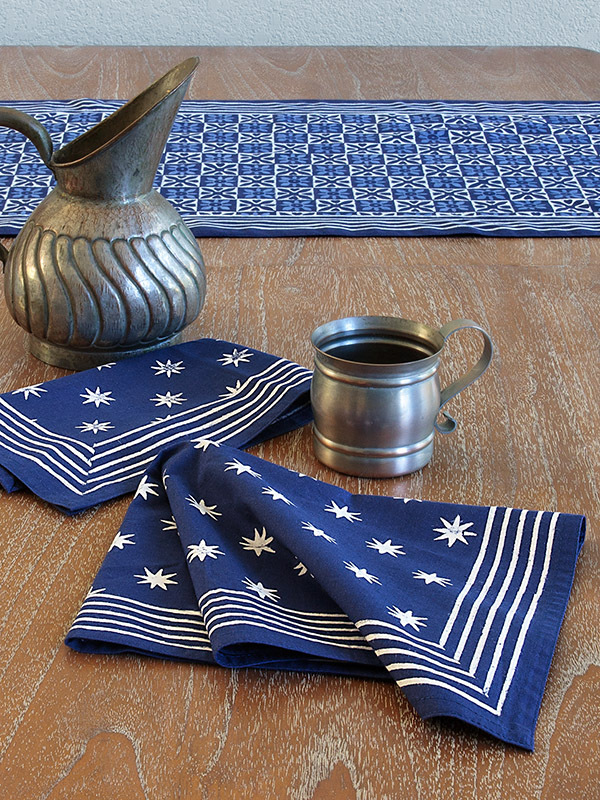 Again, take advantage of understated and sophisticated style to let Starry Nights shine.